Now JOE'S BIKES is very much a part of my Life Behind Bars, in the short time the shop has been open it has created a bit of a stir, it has taken a lot of work to get this far and there is a lot more to do, we have some great products and the service we are giving is getting great feedback and customers from all over the UK already. I have started working with some great companies some of whom I have known for many years and continue to seek out suppliers of other good products. Some of our brands to date include Santacruz, Isaac, Niner, Juliana, Saracen, Orange, Madison, Shimano, Endura, Royal, Sram, Rock Shox, Camelbak, Giro, Bell, Park Tools, Exposure Lights, Cateye, Polaris, Lazer, Continental, Schwalbe, Stans Notubes, Muc-off etc. The website is nearly ready, it is going to be www.joesbikes.co.uk we have decided on it's framework and we will be launching it soon, we have joesbikes.com too but decided against using that, it felt a bit to international. This blog will be an integral part of the website, you will also be able to view stock and order products with the ability to pay in various ways, card, paypal etc and links to ebay. A lot of training has taken place and training will be another service we will provide, personal and group training to cater for various levels of riders requirements, something I have been working towards with my mate Roy who will be helping with this. He has a depth of knowledge and experience in arranging group and personal trips on various terrain and health and safety is his middle name. Specific group rides are being arranged and ladies nights have started happening. Lots of new clubs are emerging around the area, spin classes, gyms etc and I am trying to include them in our plans, local athletes and racers are also going to be catered for and I may even get back into doing some racing and charity events myself, thats if i can get some training in! Everything I have tried to achieve over the last few months was focussed on an official opening day, and it would not be an opening day without a personality to do the cutting of a ribbon would it? In the cycling world probably the best person to do the deed would be Steve Peat, luckily he is a friend of mine so I asked him and he agreed to it, I'm just lucky I guess. Me and Steve decided to do the opening mid week, this would not interfere with Steve's busy race calendar and be less busy for the shop, we had to be careful, if we advertised it all over or had the opening at the weekend, it would possibly shut down the Industrial Estate we are on and we just could not cope with demand. Big Wednesday arrived with a rush, the many days of work prior to were filled with long hours, the night before my mate John Godbehere gave up his time to come and help me do some bits in the workshop and we didn't leave until the small hours next day. He is a life long friend and has always helped me out in my times of need, he's a great friend and very capable craftsman, I can't thank him enough. Jonty Bright from Santacruz came down to help build bikes with Roy and do the information and sales thing, many friends turned up to help throughout the day and the vibe was something special, a really good atmosphere. Steve Peat turned up just in time for interviews with local newspapers, Lynne had sorted some sandwiches, cakes and snacks and we all drank relabelled stella artois (other drinks were available on the day) then we cut the ribbon, took photos, and talked about bikes. Steve was getting his Santacruz 5010 ready for the ride and decided to nip around the corner to the jump spot, he'd spotted it before and want to go to it, little did he know that when he got there loads of young lads would be in attendance. They were amazed to see him roll up and show them how it's done, when he came back to the shop pied piper like he had a stream of kids in his wake, he proceeded to give stickers out and sign bikes, but only if they promised to tidy the rubbish up at the jumps. He sent them of with one of my bin bags which they came back with full of rubbish. We all got ready and went for a ride around one of my local runs, just challenging enough to give us an apetite for an meal at my favourite Indian Restaurant the Kashmir in Worksop. A few stories swapped over beers at the end of an eventful day, what more could you want? Just a great day that we will remember for a long time. Special thanks go out to all involved who made our little opening day so great, especially Steve Peat, but a big thankyou has to go to my wife Lynne who has been so supportive over the last few months leading to the open day. After the opening lots of customers have been through the door, the feedback has been great and main concensus of opinion is ''it is about time we had a good bike shop in the area'' my usual tongue in cheek retort to that is to say, "I hope you mean this is a good bike shop" haha. I've many good reasons for starting a bike shop, and the great reactions I have had has shown I was right in doing so, repairing bikes and advising fellow riders on bikes and kit is great but it was getting to be a bit of a task to do at home at night, sometimes late night knock's on the door can be a bit annoying so getting that into a shop format was the sensible thing to do, returning customers have proved that. Working with manufacturers in the bike industry and contacts made in the trade over the years have been very useful, knowing a lot of riders in various forms of bike riding has been too, doing signage work in the cycling world has also provided good in-roads, Whitakers Signs & Design Ltd will continue to be my baby and we will continue to provide quality work for my customers. I know most of the Santacruz family, from dealers like Stif Cycles, Importers Jungle, mechanics and riders at national and international level, all the way through to Rob Roskopp and the team in the USA, it gives me an edge that most shops could never dream of, hopefully my customers will think so too. 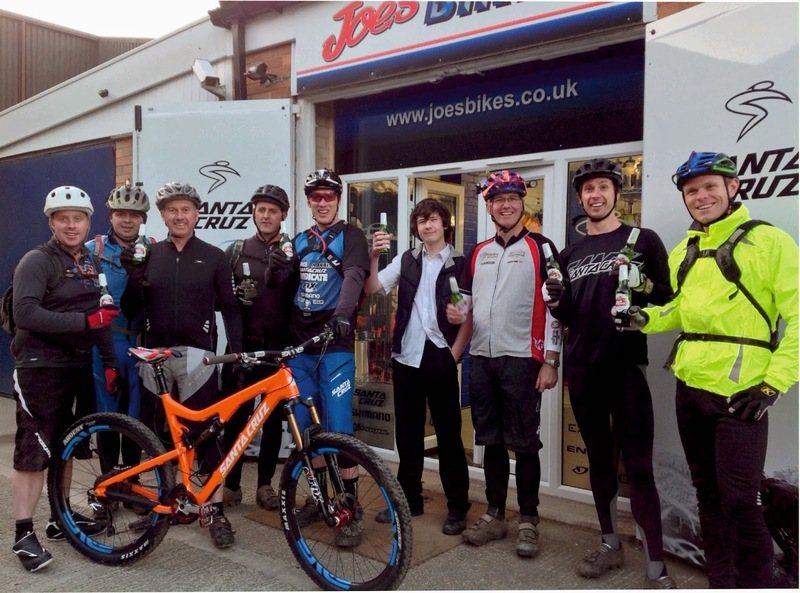 Anyway here's to the future of Joe's Bikes in Worksop, a little bike shop with a bright future, thanks to all of you that provided the inspiration that made it happen and I look forward to welcoming whoever walks through the door, Cheers, I hope to see you soon.